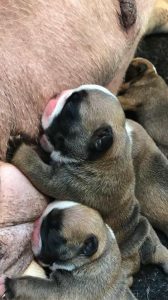 We are so excited to announce our first litter of puppies sired by our top boy Tommy! They are absolutely stunning puppies and a huge litter of 9 so we certainly have our hands full! They are thriving, mum is doing well & is feeding them herself. We do have a waiting list so please do get in touch as soon as possible if you’d like more information of joining our list.